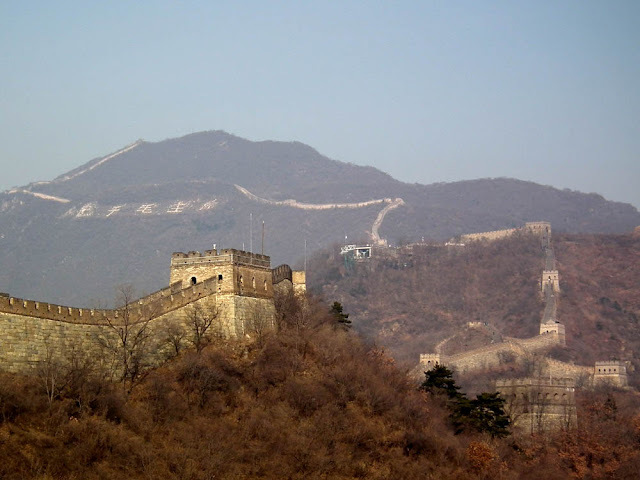 Today is Chinese New Year so I thought I would take the opportunity to post a couple of photos from our visit to the Great Wall in late 2012. The section of wall we visited is at Mutianyu. 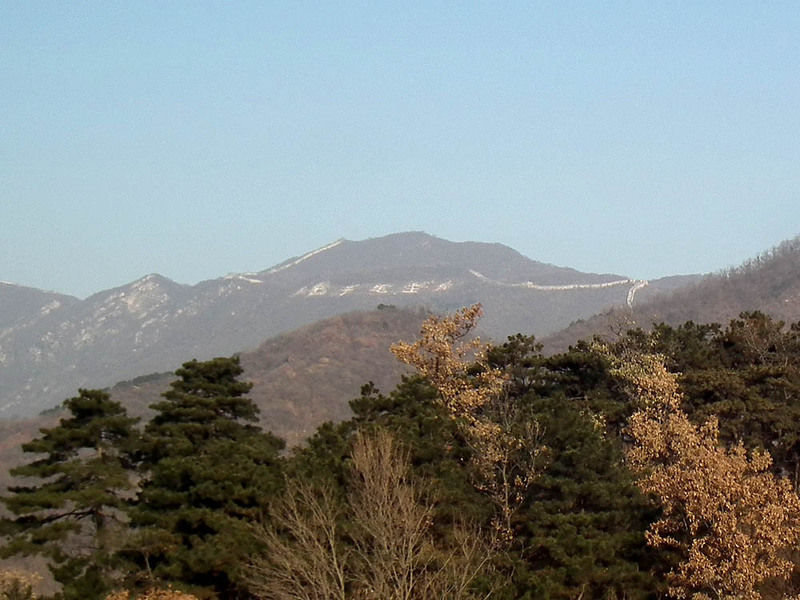 In the distance we could see huge Chinese characters created in the landscape. Our guide told us that they were made during the Cultural Revolution and say 'Loyalty to Chairman Mao'. 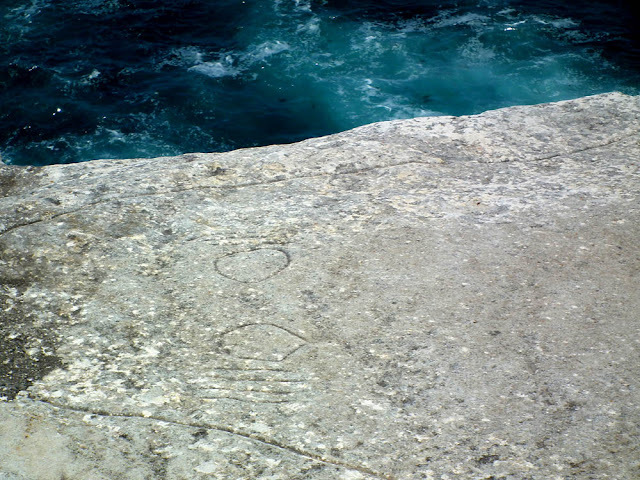 I have since found out they probably date from 1968, and were made by Red Guards from limewashed rocks. Over the years the limewash dissolved and the scrub grew up, hiding the slogan. 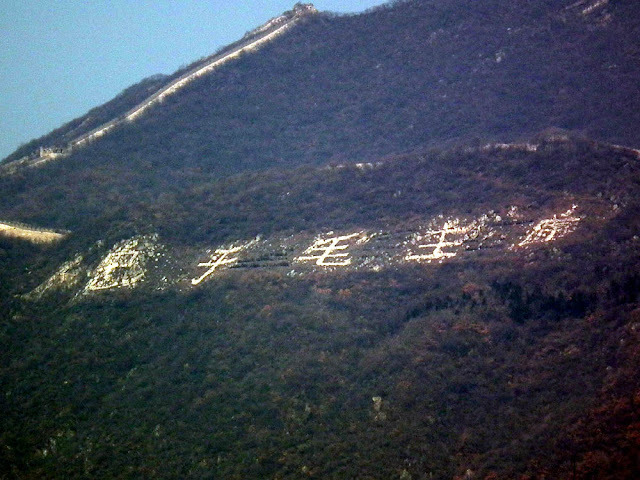 In 2009 the authorities sent a team in to clear the undergrowth and repaint the rocks, thus they are visible again. The tail of the fish. When we did the Eastern Beaches Coastal Walk,our friend Stefania pointed out an Aboriginal rock engraving to us. She's a qualified eco-guide with a particular interest in Aboriginal cultures, and it was just as well we had her with us, as we would never have noticed the engraving otherwise. You can only just make out the engraving in this photo, and that's after I have lowered the brightness and upped the contrast in PhotoShop. It is quite weatherworn, being right on the seacliff. It depicts a large fish with gills, either a sea ray or basking shark (although the aboriginal story calls it a whale). There is an excellent web page here which tells you all about it, including relating the Dreamtime story associated with this site. Dreamtime stories typically describe ancestral totemic animals creating the landscape or establishing some rule of how you should live your life. The stories coalesce to form songlines, which act as oral maps, passed on to all those who have an association with the land. 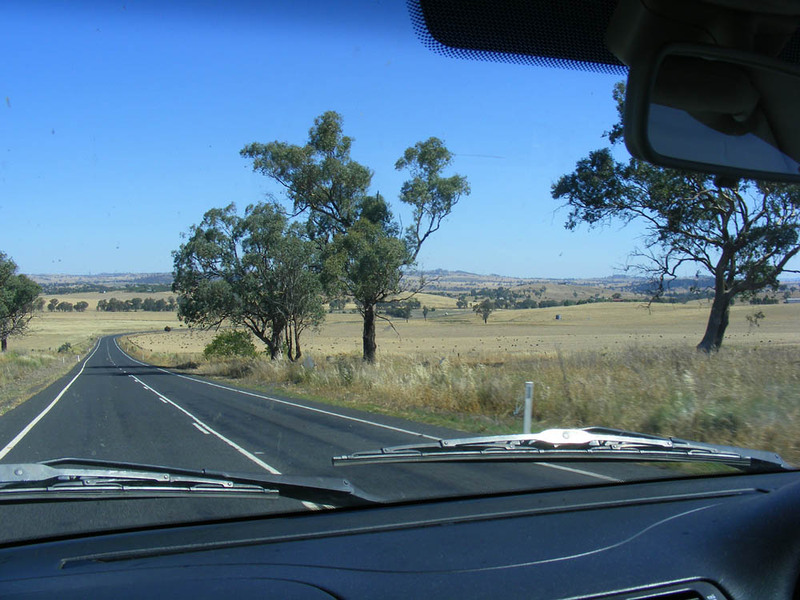 The songlines allow a nomadic people with no written tradition to pass on information about routes and how to survive along the way. 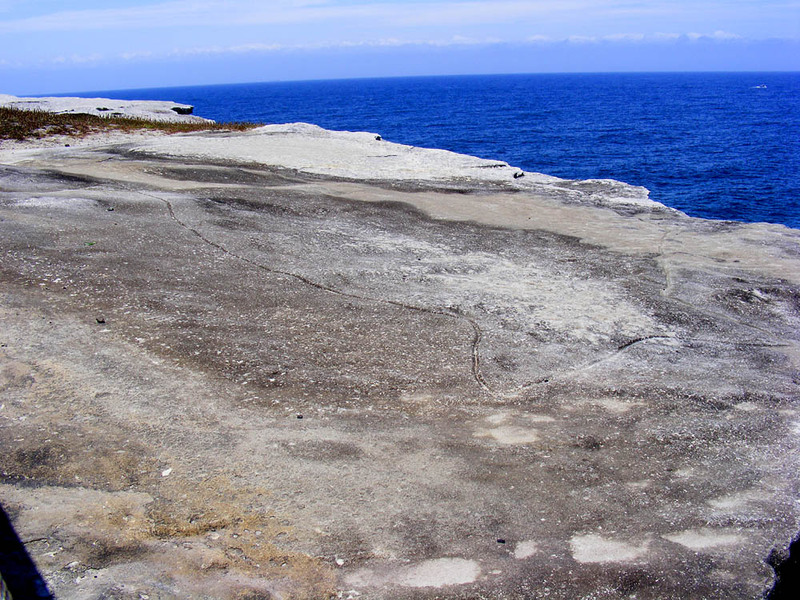 Glamorous Tamarama! Or Glamarama to the local wits. If you think you're beautiful enough, this is the beach to come to in Sydney. 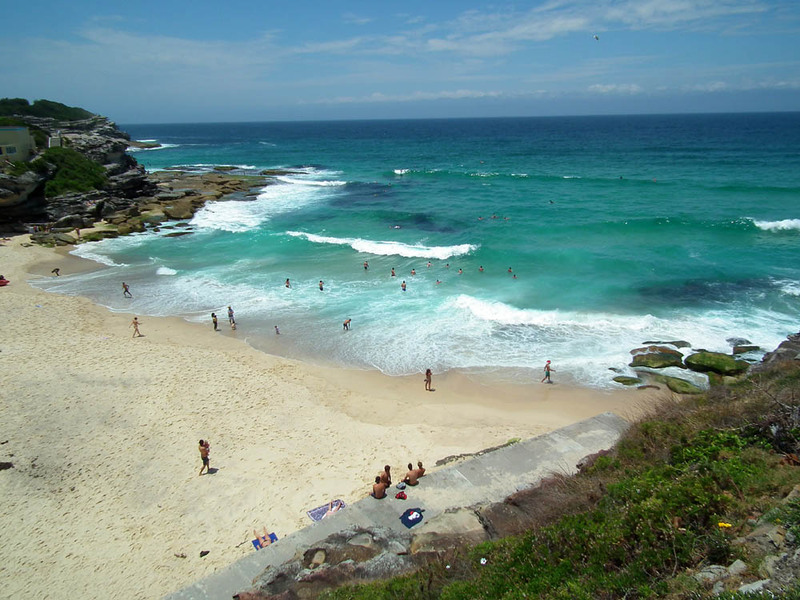 Just south of Bondi, this intimate little cove is known for attracting those who want to parade their bodies and look good. The water is treacherous, so no one will be surprised if you don't go in. But the lifeguards take their role seriously, and checking with them where the best place to swim is means you get to talk to the Bronzed Aussie at the beach. Apparently the café is recommended as a people watching venue. 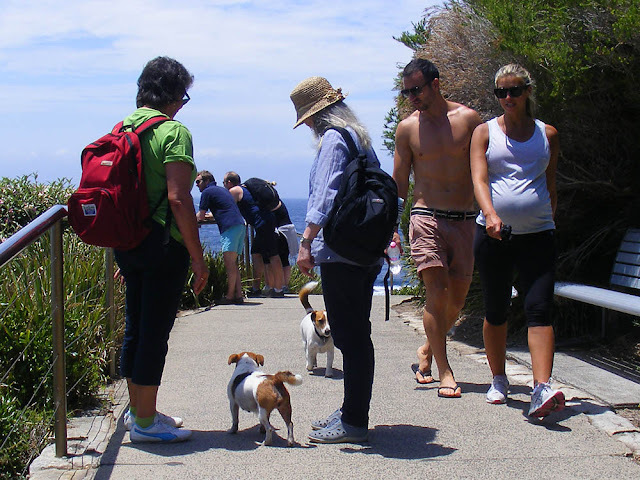 When we did the Eastern Beaches Coastal Walk in December 2012 we had the pleasure of our good friends Liselle, Stefania and Alex for company. The couple on the right are strangers, but they and Stefania had matching Jack Russells. 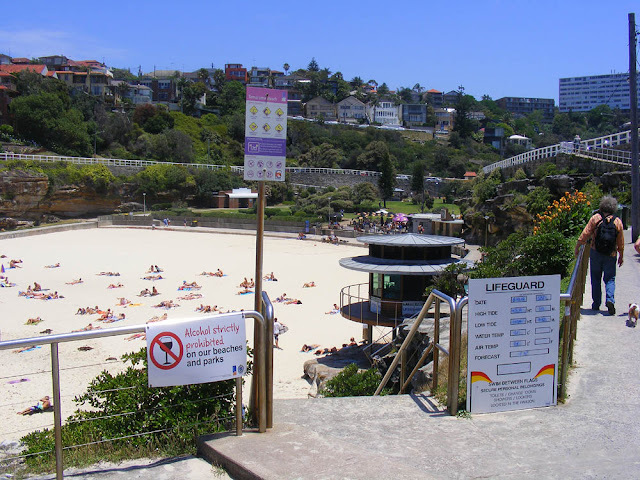 The local councils responsible for the management of Sydney's eastern beaches are all waging war against invasive alien plants. They are systematically weeding out the foreigners and replacing with natives. 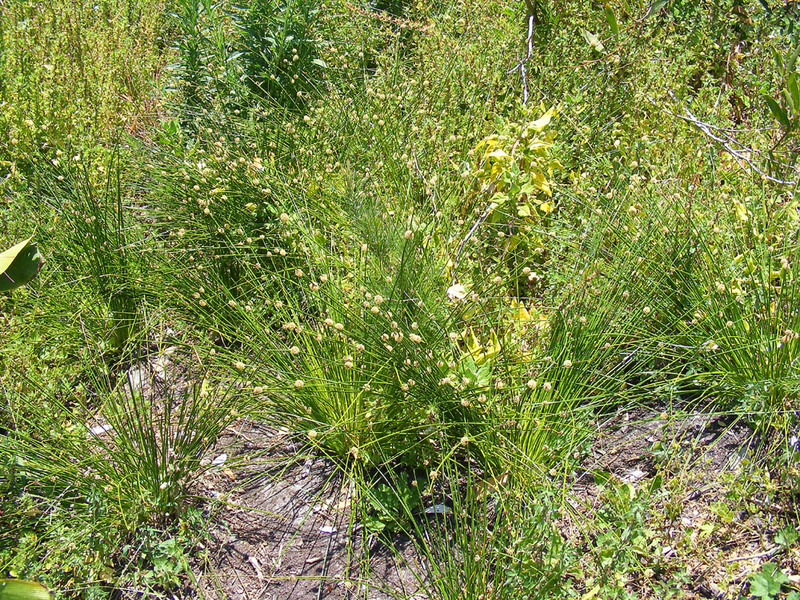 The picture above shows newly planted Knobby Club-rush Ficinia nodosa, a coastal sedge that grows all along the edge of the southern half of Australia. Despite its vernacular name, this is not actually a rush, nor a grass, as most of the locals think, but a sedge (Cyperaceae), as are the plants of a different genus that are known as club rushes in Europe. The photo below shows well established Knobby Club-rush. Stefania tells me that the plant was used by aboriginal women to weave baskets and bags. Arguably the best known stanza of Australian poetry there is. Most Australians could just about stumble through it and would certainly recognise the first four lines. 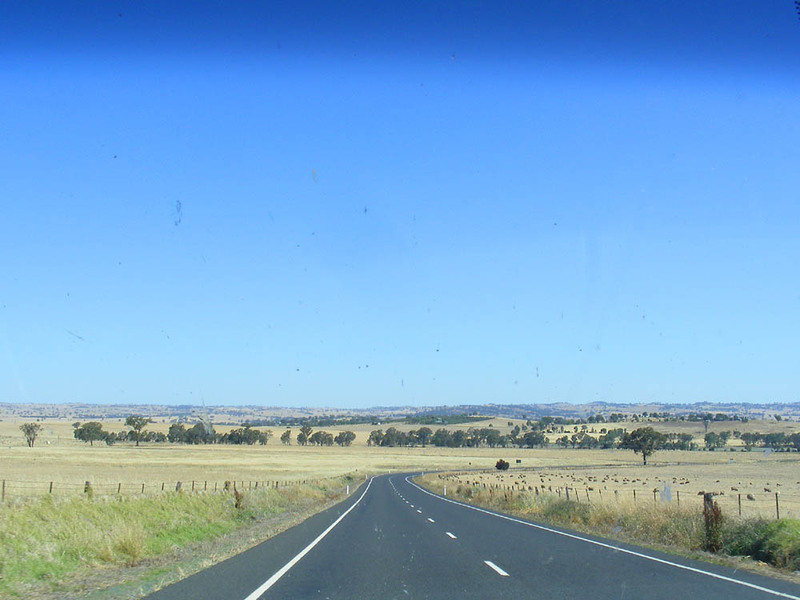 Many would be able to tell you the name of the poet, Dorothea Mackellar. The full poem, called 'My Country' can be read here. The extract above is the second verse. It was written in 1904, when she was 19 years old (which explains a lot about the style). 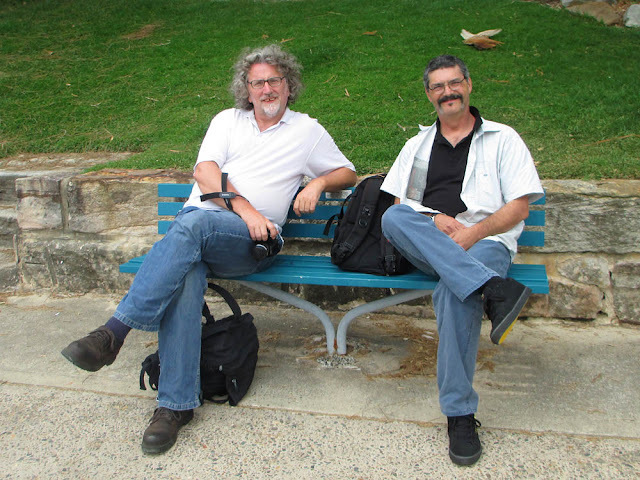 In its sentimentality and doggerel rhythm it is very much of its time, but it still resonates powerfully with many Australians because of its simple emotional tug. 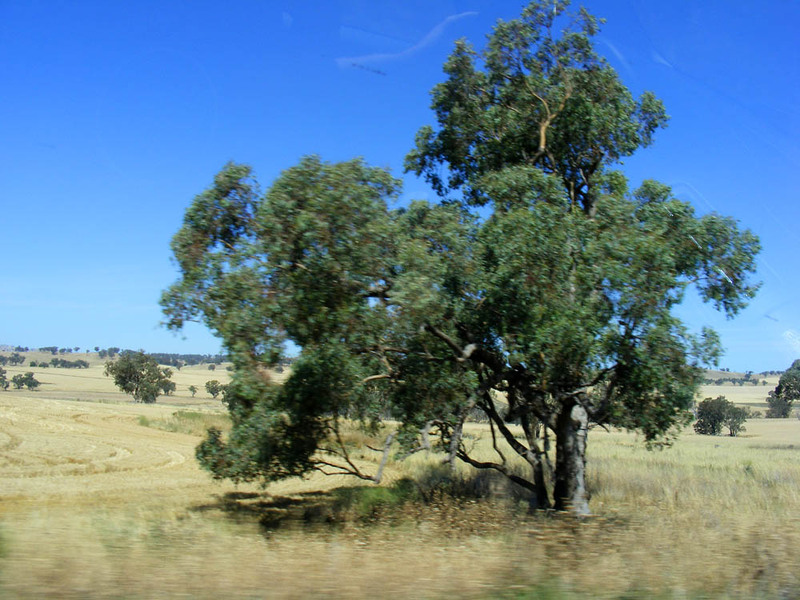 These photos were all taken from a moving vehicle on the Mitchell Highway, coming down to Cowra in central New South Wales, in December 2012. 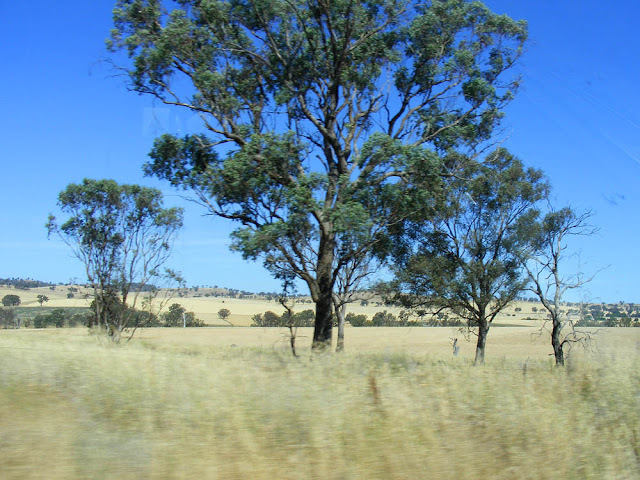 This is the sort of landscape that I think of as quintessentially Australian, but that may be because I spent my early childhood in countryside that was not dissimilar. 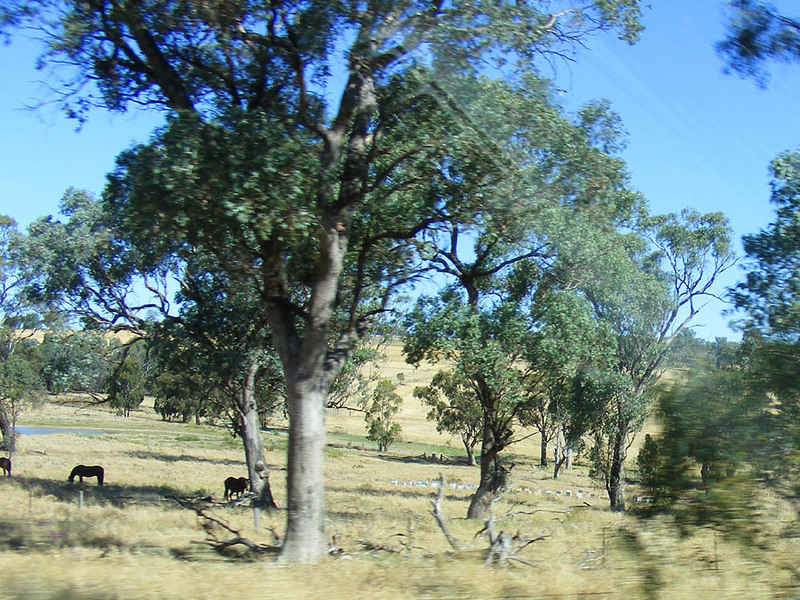 It's sheep pasture and cereal crops on rolling hills dotted with gum trees, with mountains in the distance. I am sick of all this horrid business, of politics and Europe in general, and think you will hear some day of my going with the children to live in Australia, and to think of Europe as of the moon -- Queen Victoria, in her journal, May 1860, as a reflection on turning 41 years old. 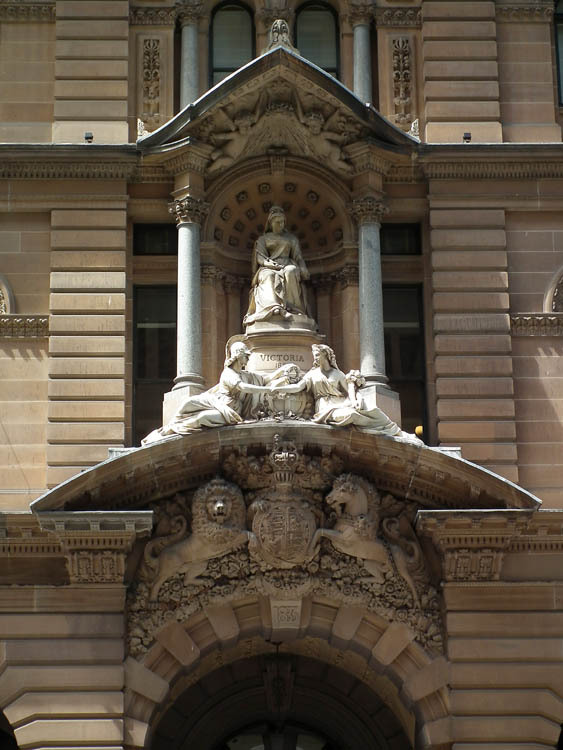 The young colony would have been delighted, I am sure, as this expression of imperial might and beneficence on the 1866 GPO building in Sydney shows. What Would Byron Have Said? 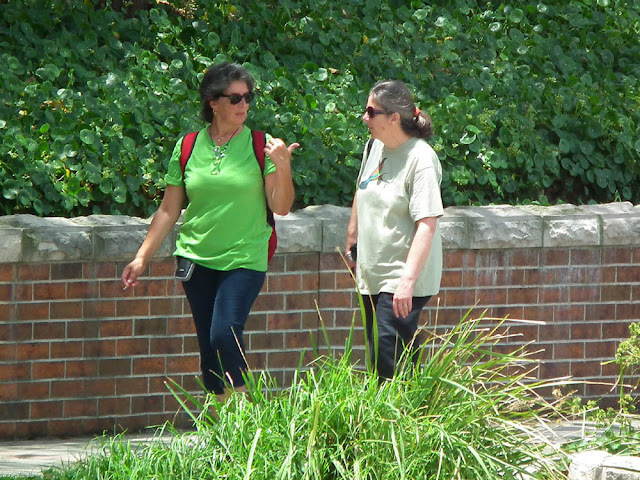 A better photographer than me would not have treated this as a snapshot. They would have waited until the shaft of sunlight was in exactly the right spot to create visual drama. 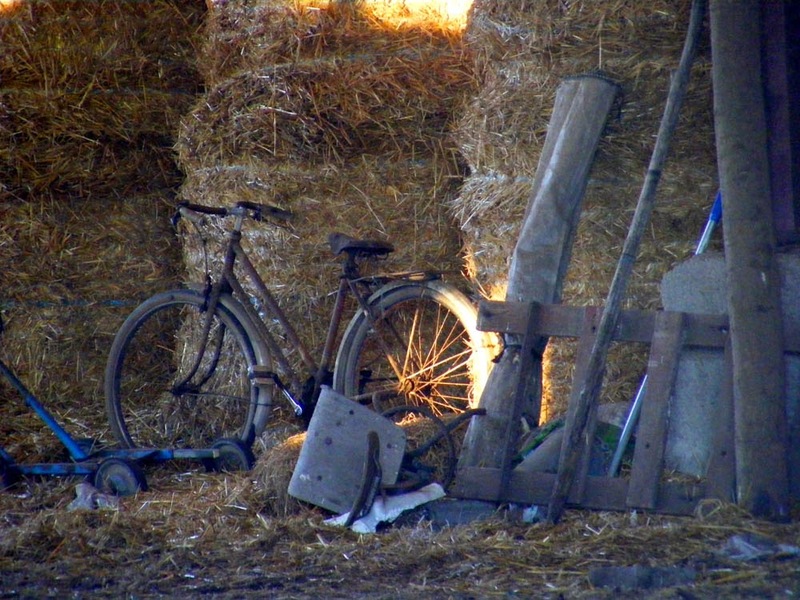 They would have cropped it so that the pile of old junk that surrounds it looked intriguing. They would have taken several shots from several angles and chosen the best. I did none of these things because they seemed so cliched, and because it's not the sort of thing I normally bother to photograph. I happened upon this scene when mooching about the backblocks of a nearby village. It's the sort of shot, properly dressed up, that appears in countless picture books extolling a bucolic wonderland of peace and contentment. I can appreciate a well presented photo for its design qualities -- lines, colours, proportion and so on. What I don't have an eye for is what someone is going to consider 'romantic', although I can sometimes guess. So why have I published what I clearly think is a very ordinary, not terribly interesting photo? It gives me chance to muse on this curious word 'romantic'. It is a word often applied to France, and in particular Paris. I simply don't know what the word means in this context and what the attraction of this notion of 'romantic' is. Is it a synonym for 'sentimental', or 'fantasy', or 'idealised'? Is it a word that means something different to everyone? Has it changed its meaning over time? Would the context it is used in today be recognised by Wordsworth or Shelley? What about Baudelaire or Hugo? Specifically, what is it that 'romantic' means to you and why? 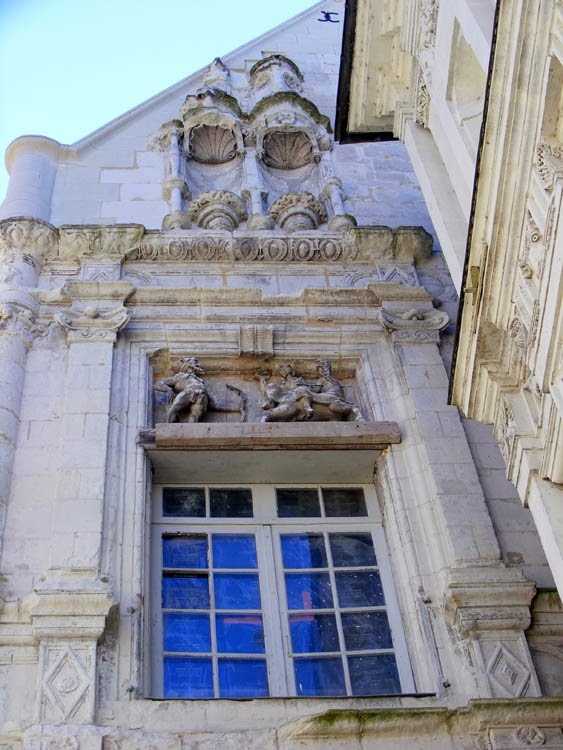 Attached to the house called la Chancellerie, la Maison du Centaure is situated at 10 rue du chateau in Loches, in the protected heritage conservation area. It is in the historic heart of the town at the foot of the chateau and the Logis royal, close to the town hall. It has been listed as a historic monument since 1927, for its facades and roofs. 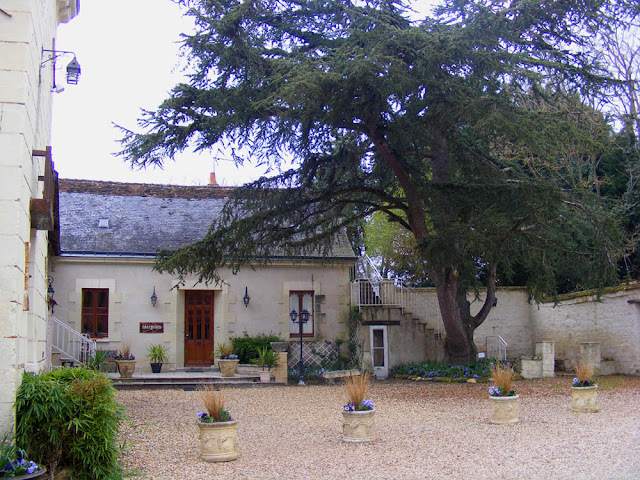 La Maison du Centaure is a grand town house constructed under the reign of François I. Its architecture and rich decoration, which looks like that of the town hall's, belonging to the early Renaissance from the beginning of the 16th century. You can see particularly the same freizes and niches surmounted by scallop shells and pinnacles as well as pilasters with ornate capitals of children and lions. The low relief sculpture which gives its name to the house originally graced the mantelpiece of a monumental fireplace. 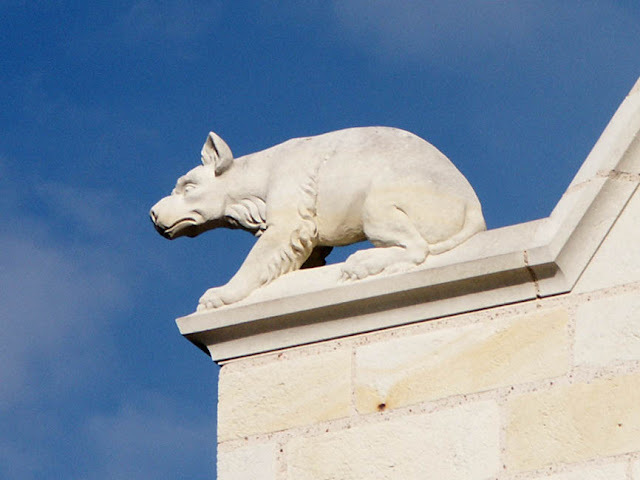 It was placed in a former window frame on the north facade following alterations and renovations in the 19th century. It represents a mythological scene, probably taken from Ovid's Metamorphosis, indicating that the person who commissioned the building was undoubtedly cultured and educated. 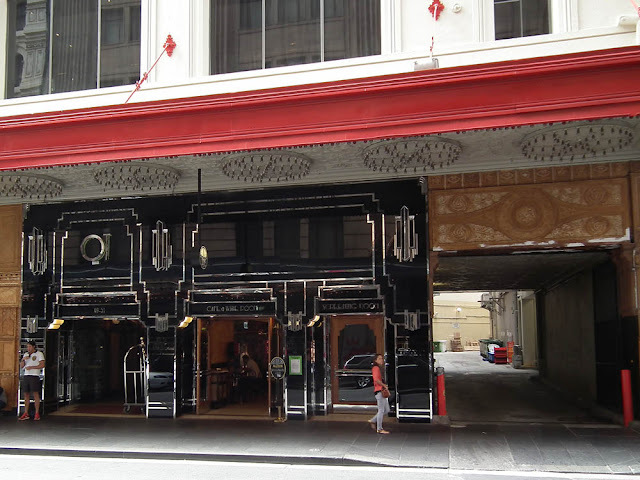 Surveys have revealed the original layout and support, among other things, the reinstatement of the Renaissance bays on the facade facing the street. The restoration of the exteriors is the first stage, preceeding the general renovation of the house and its conversion into apartments. Sadly, restoration works on the exterior of the house have been temporarily halted following problems with the funding of the project. Work will recommence as soon as it is possible to do so. reinforcement and restoration of the carpentry. creation of roof windows with a view to future renovation of the interiors. complete renewal of the slate roof. consolidation and restoration of the remaining chimney stacks. consolidation and restoration of the rear facade. restoration of the upper parts of the northern gable facing the street. demolition of modern interior alterations. The facades facing the street have not been restored within the framework of what has been achieved so far. As a consequence there are still some conservation measures to be taken. 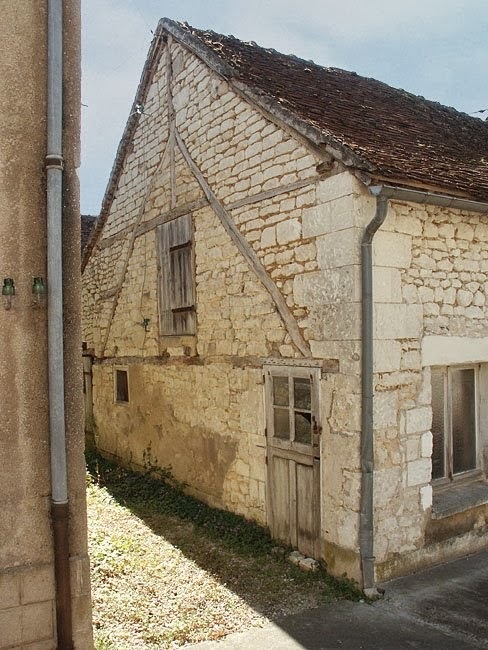 Whilst awaiting final reinforcement of certain parts of the structure the second floor windows on the east facade facing rue du chateau are braced with struts and the pillar taking the load of one of the master beams of the upper floor is held by a yoke to prevent it buckling. The low relief sculpture of the centaur is held in place and supported to prevent it tipping towards the interior. Ultimately, its expected reinstallation effectively means the simultaneous reinstallation of the window frame. The total cost of the project is estimated at €484 500, of which the State has contributed €96 900 (20%). rearrangement of the Louis Philippe stables, which with the new ticket office, will be open no later than 1 July. Visiting the stables will be the last section of the visitor route and the main exit will, from this year, be via the Heurtault Tower (on the south side). installation of a lift within the chateau, next to the Heurtault Tower, which will serve three levels and allow fully integrated access for the disabled. the total cost of the work will be 1.5 million euros. This year the chateau unveils its hidden treasures by opening new exhibition galleries. In the Medici Gallery (first floor, above the river Cher) there will be a display of unusual works of art, paintings, tapestries, furniture and objects as well as documents on the construction stages and the events marking the very rich history of the chateau. a Gallery of Carriages will be opened in the 17th century farm stable which will display a collection of horse drawn vehicles from the 18th and 19th centuries. in the Galerie des Dômes, at the beginning of summer, a space will be especially dedicated to the contemporary history of the chateau, such as the military hospital installed in the building from 1914 - 18. It will be in recognition of all those wounded and carers who came here during the four years of the Great War. 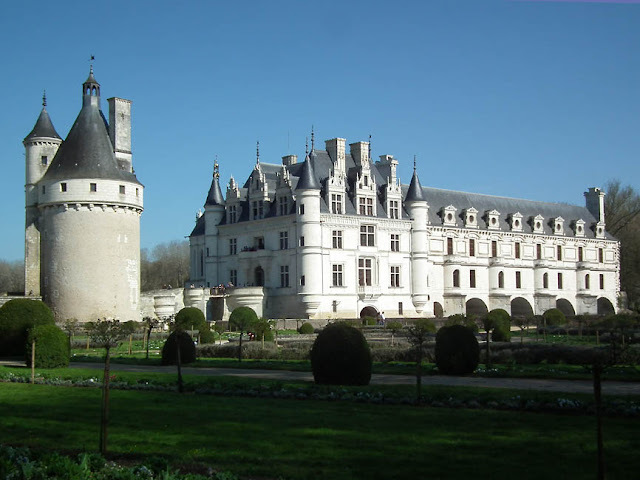 More than 2250 wounded were cared for at Chenonceau. From April to November the fortress will stage a walk through the history of the Templars, with the theme of 'East Meets West'. There will also be an exhibition in the chateau on the soldier-monks and the treasure of the Templars. A big exhibition of film, television, theatre and opera costumes from productions about the Middle Ages to the Renaissance displayed in 18 tableaux and including the gown worn by Isabelle Adjani in La Reine Margot. 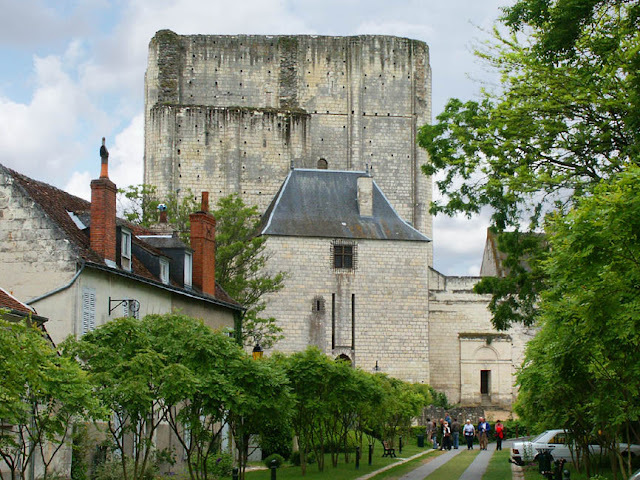 all summer the citadel and the royal chateau will celebrate the millenium of the Keep (Donjon) built by Foulques Nerra. For three weekends in August there will be a light show at night. 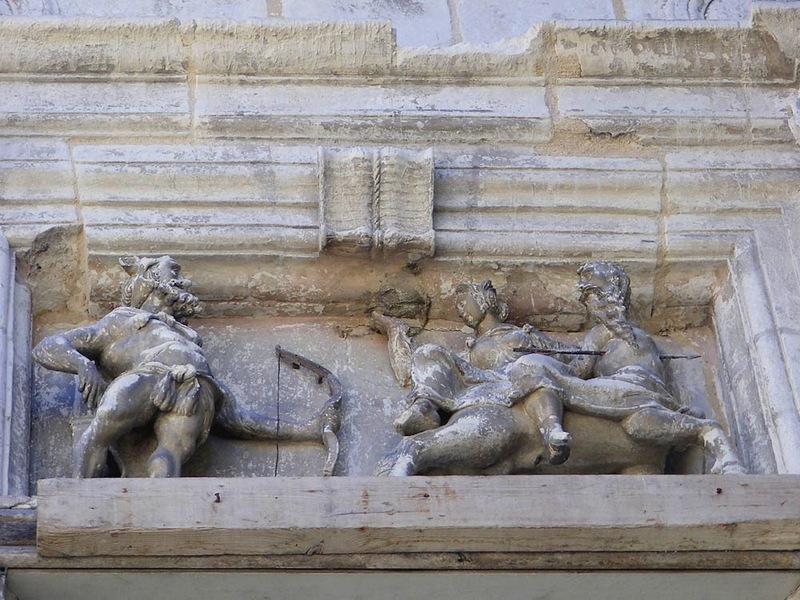 from October, a big exhibition 'Twenty Centuries of Sculpture in Touraine' (Vingt siècles de sculptures en Touraine). a study will be commissioned to look at reinstating the entrance to the site along the axis of the chateau. 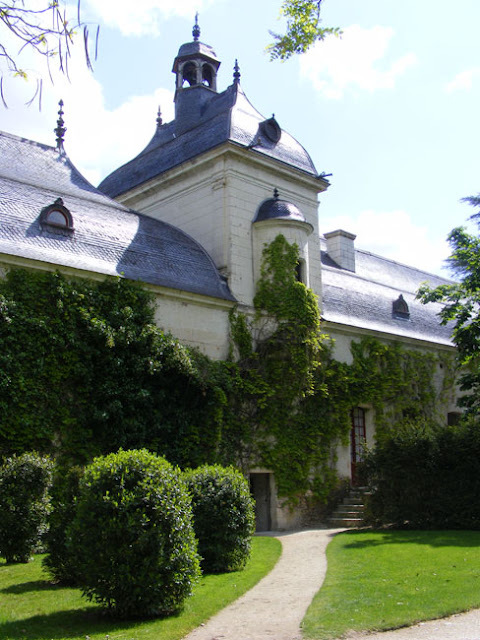 a big exhibition this summer on the birds of Villandry (the site is classified by the League pour le Protection des Oiseaux) with an exhibition of sculptures by Marine d'Harcourt in the Sun Garden. 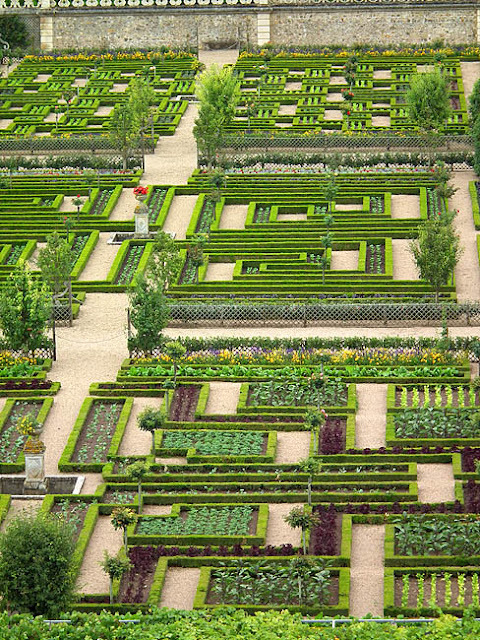 on 21 September the route of the first Touraine Loire Valley Marathon will pass through the potager. renovation of the Spanish paintings gallery in the chateau. 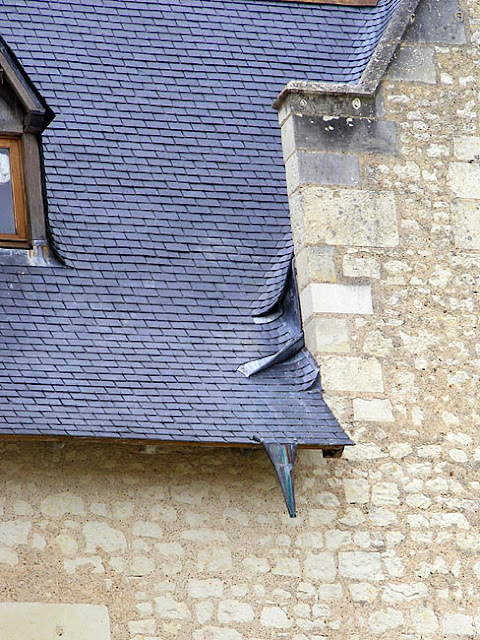 The narthex (porch) of Saint Ours church, Loches is being spoilt by water ingress, so a black bitumenised membrane has been installed on the roof. This is theoretically a temporary measure until a full restoration of the whole church can be effected. The traces of moisture on the narthex vault are very visible. They won't go away any time soon, but the membrane should prevent any further infiltrations of water. 'The stones have become porous and it was important to stop the damage', said a spokesman responsible for heritage from the local authority. 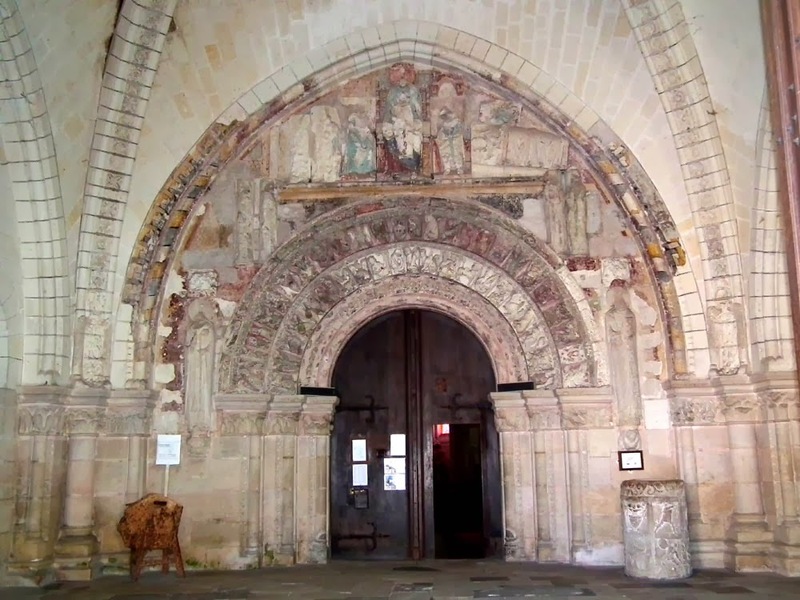 The remarkable 12th century polychrome carved doorway between the narthex and the main body of the church of Saint Ours, Loches. The work was done in December with agreement from the Bâtiments de France architect and the regional curator from Monuments Historique. The membrane covers the stone roof slabs and ensures they are sealed. 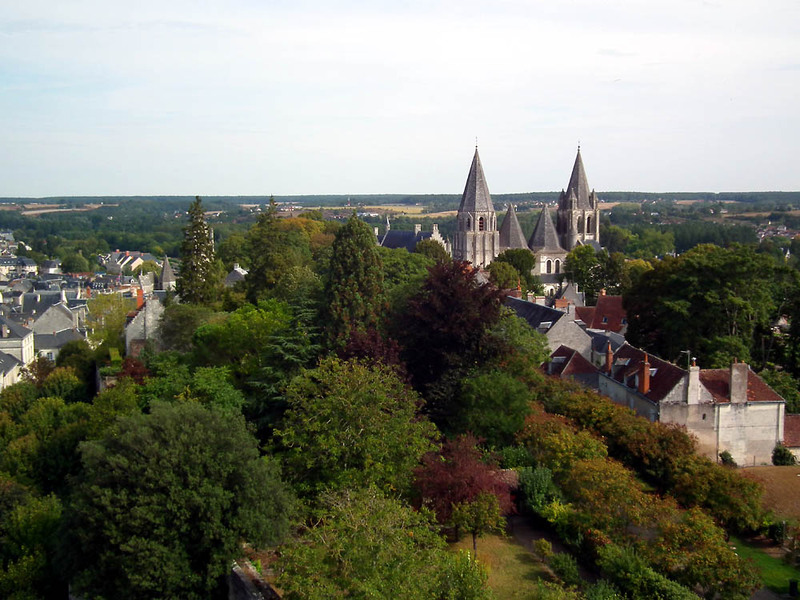 The work cost €13 000, entirely paid for by the Ville de Loches (in the interim while they await the outcome of various grant applications). The membrane should allow the roof to dry out and prevent new stains appearing in the entrance to this listed historic building. 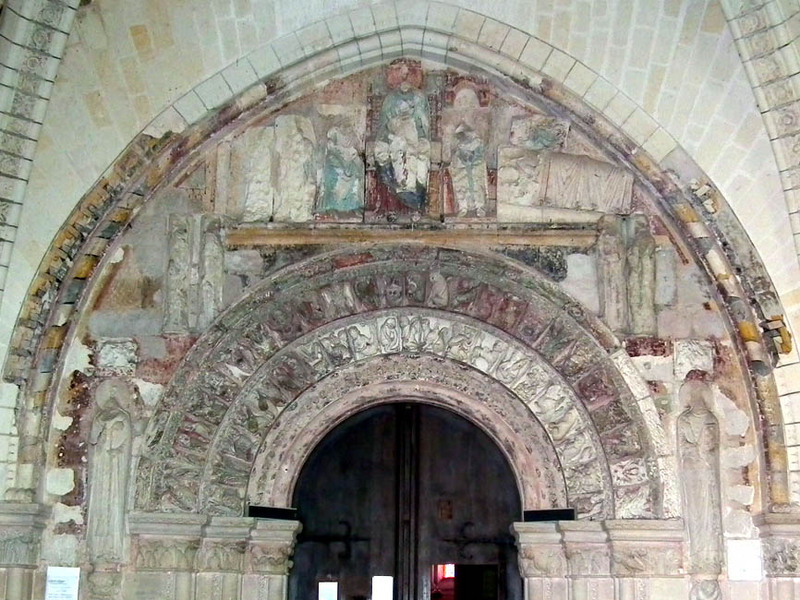 A wider view, looking from the door of the narthex to the door of the church. You can see damp stains by the vault rib on the left. This technical solution was chosen because it is at the same time durable and easily reversible once a full restoration gets underway. Amongst the other problems which need dealing with are fissures in the bell tower above the transept and water ingress at the base of the dubes, those hollow pyramids which afford the structure such a large part of its unique character. (The extensive green staining on the interior of the dubes will be easily dealt with once the damp problem is solved.) Now the local authority is waiting to do a full conservation report which will highlight the work that needs to be done overall. 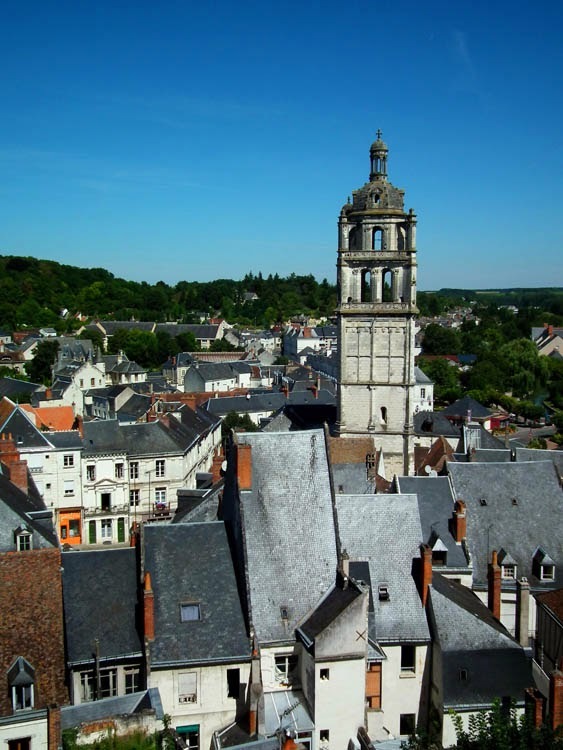 A view of Saint Ours showing the dubes (the pyramidal roofs). It still remains to find funding for this study (never mind the work that will come after it). 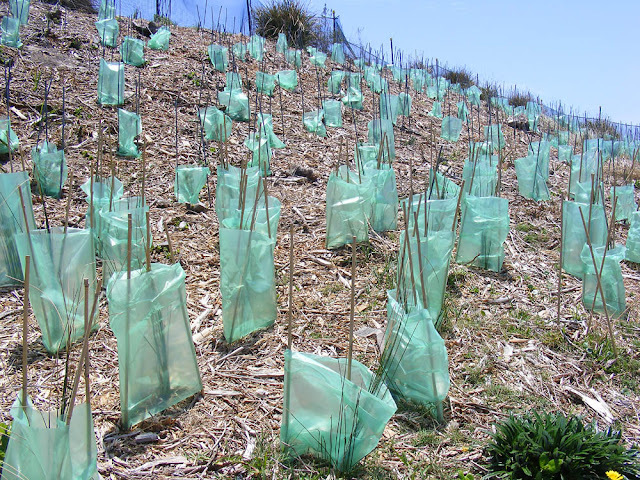 The length of time it takes to raise the funds will determine whether or not the membrane is truly a temporary solution, or whether it has to last indefinitely. Source: La Nouvelle République 11 January 2014. Tiles and slates on the same roof slope -- a sure sign of repair. Some very steep slate roofs. 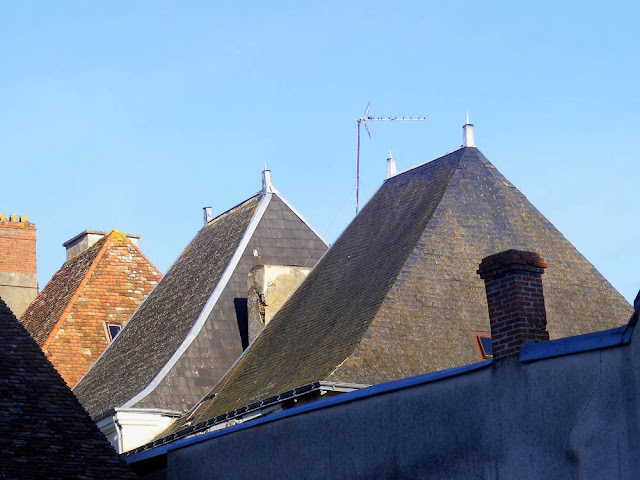 In the majority of cases, roofs of two symetrical slopes are favoured, inclined at an angle of between 40 and 45°. Slates covering the walls as well as the roof. Two sorts of materials are generally used in the Touraine: small flat terracotta tiles and natural slate. A complex of buildings with a mixture of tiles and slates on different slopes. The presence of tiles and slates on the same slope of a roof would not have been the way it was done traditionally, but it is a style of roof repair which it is better to avoid when the entire roof is redone. During the 19th century, local artisanal tile factories experienced a boom. 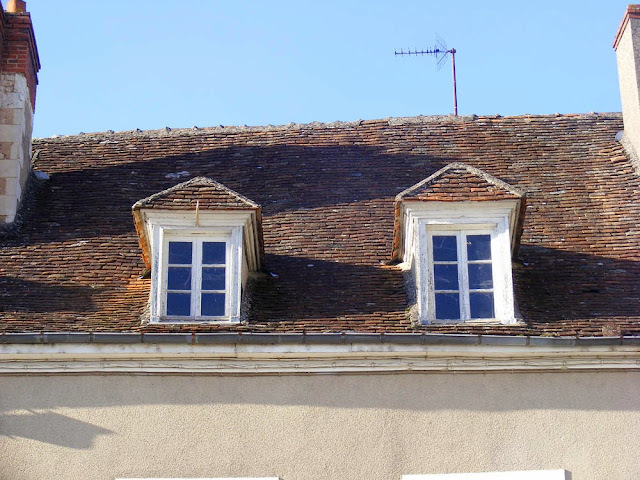 Flat tile became the material of choice, still visible on numerous buildings in our towns and villages. It is as well represented on industrial buildings as on dwellings. 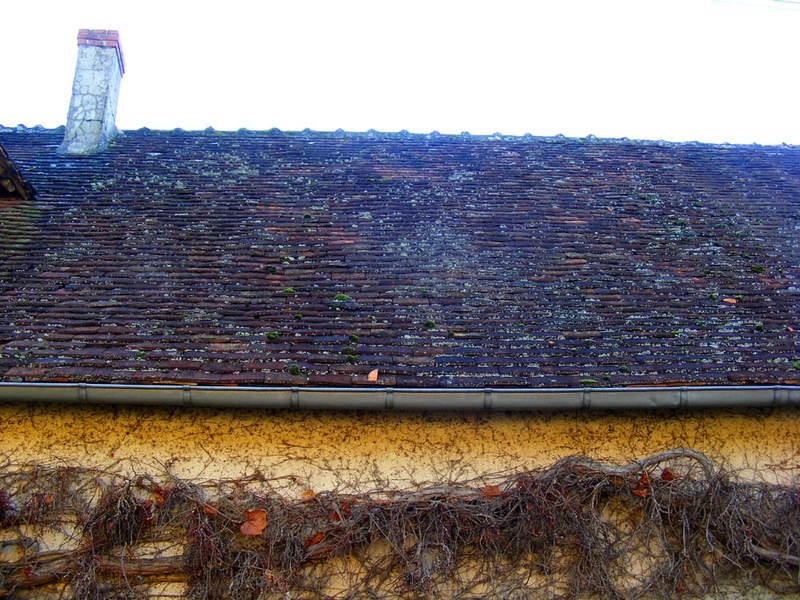 The roofs are made of small flat tiles in red-brown or orangey-red, depending on their source and state. 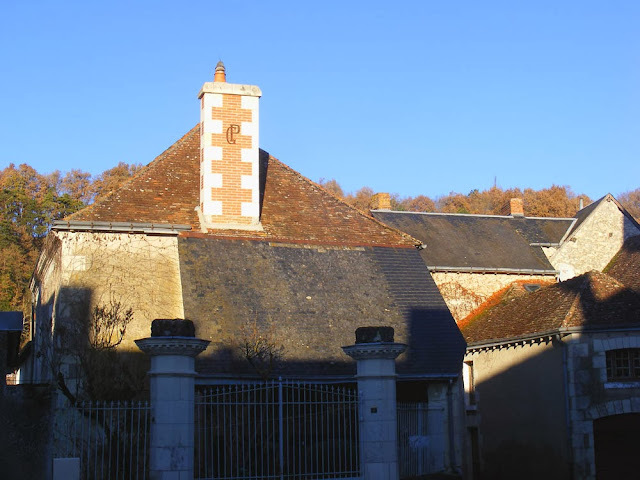 That's why tile roofs aren't very homogenous and the effect is to blur the colours. One peculiarity of the Touraine persists in Richelieu, where you can sometimes find a tile called tige de botte ('boot upper'). It looks like a roman canal tile, but doesn't have the same dimensions. Slate treated decoratively and solving a practical problem at the same time. Coming from the Angers basin and transported up the rivers, slate was reserved for the nobility. If its light weight rendered it easier to transport on the river, its delivery was nevertheless costly. 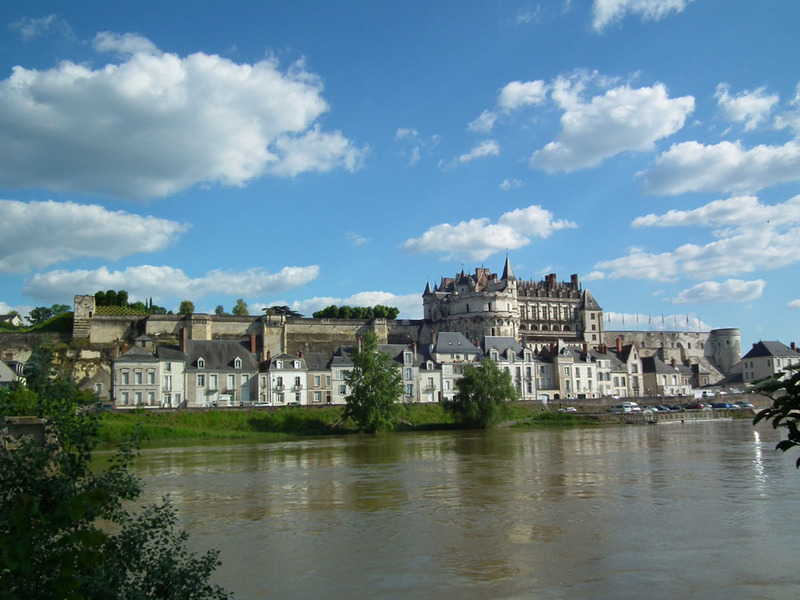 Over the course of the second half of the 19th century slate little by little became more widespread along the banks of the Loire, in the centre of towns on maisons de maître (elegant town houses), before spreading into the countryside. Fish scale patterned decorative slate. 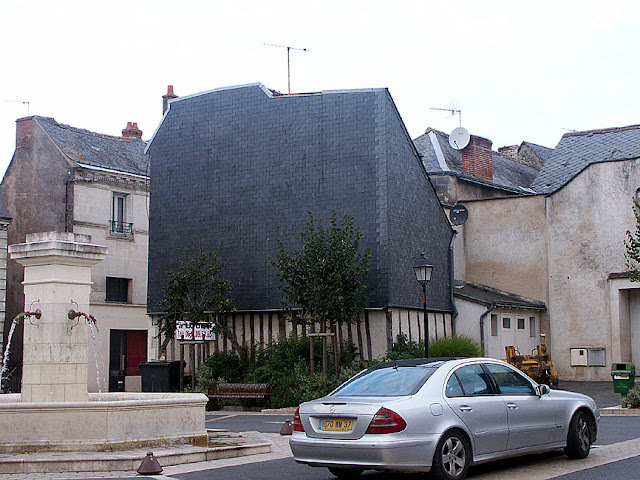 Sealed by metal sheets, slate can be adapted to all roofs with a slope between 30° and vertical. They are attached with a nail or a hook, preferably black in colour. Slate can be shaped into many complex curves and angles. To obtain the best effect it is recommended for restorations to choose traditional flat tiles. The advised density is 60 to 75 tiles per m² minimum, depending on the pitch. It is to be regretted that today, tiles are tending to disappear in favour of slate. Slate and tile roofs, with the middle roof showing the metallic flashing which ensures the angles are waterproof. 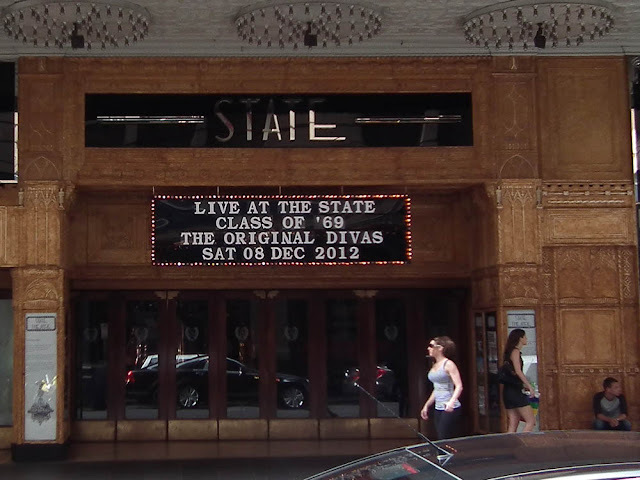 Despite its name, the State Theatre in Sydney is not a national institution. It was built in 1929 for the Greater Union organisation and is still owned by them. I've only ever attended a performance there once, many years ago. It's very grand inside, with the second largest chandelier in the world hanging over the auditorium and toilet anterooms like luxury hotel reception lounges. Soul Pattinson are a household name in Australia, a bit like Boots in the UK. 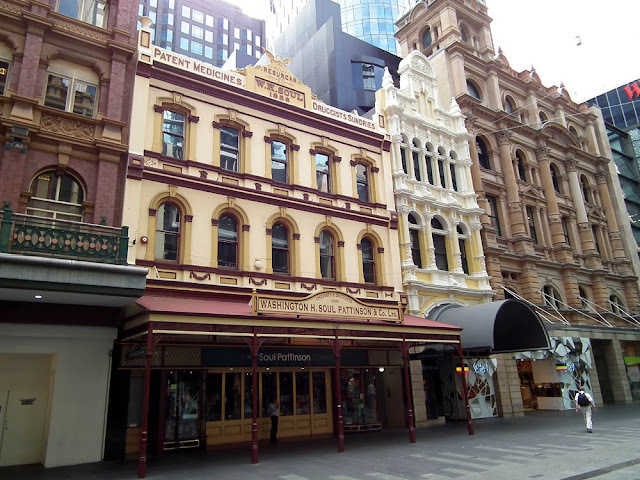 The Victorian Italianate building above, in Pitt Street, Sydney, is named Phoenix Chambers, as it was built in 1887 to replace the original Soul Pattinson building on this site, which burnt down. Until 2000, when it was bought out by Australian Pharmaceuticals Industries Ltd, Washington H Soul Pattinson Ltd was a family run pharmacy company listed on the stock exchange since 1903. Even today, a fourth generation of Pattisons are involved in the business. There are currently 100 Soul Pattinson outlets across Australia. 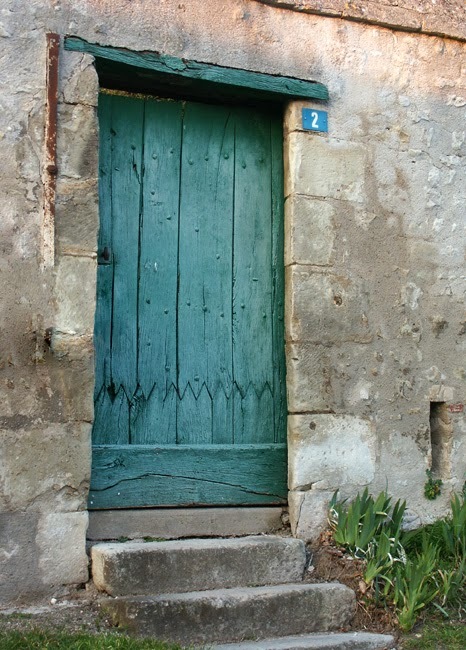 Farmhouse door in a wonderfully rustic house. 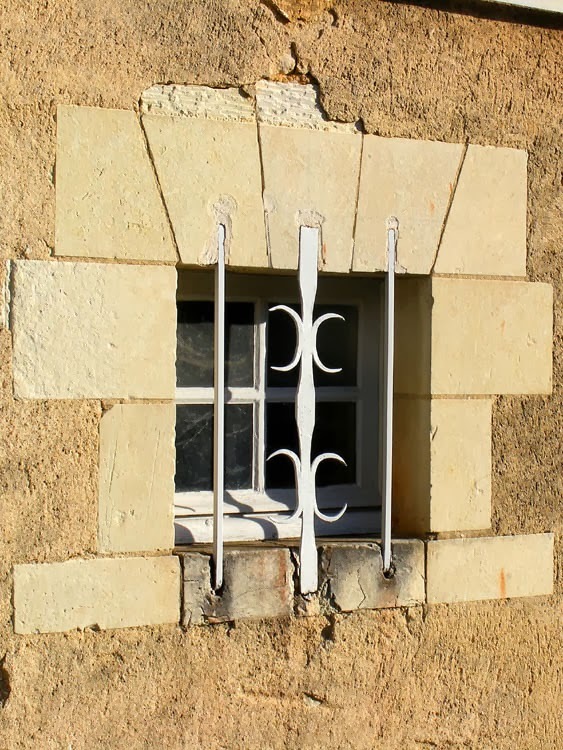 Plain and decorative metal bars over a secondary window. Strictly speaking these should be painted a dark colour. Hand forged iron bars on a cellar ventilation opening. Note the small teeth along the length of the angles. Houses in towns generally have a plain door with a transom (imposte vitrée). Rural houses have half glazed farmhouse doors with four panes of glass higher than they are wide. This door was usually mirrored by a protective shutter that functioned independently from the door and could be operated from inside the house. This model was a good compromise to allow light and security at the same time. 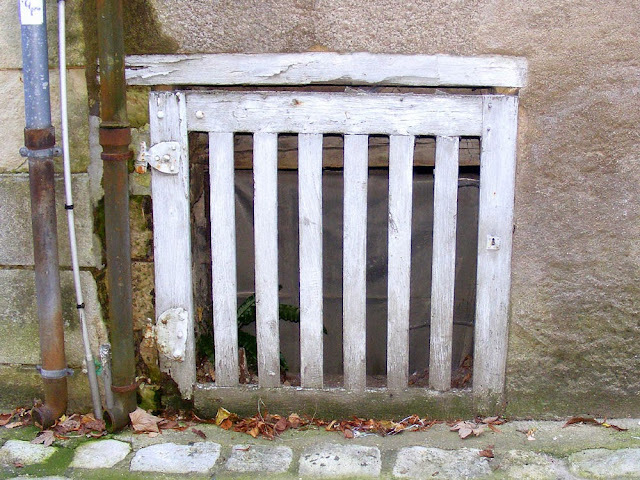 The lower solid part, called a portillon prevented animals from entering the house. 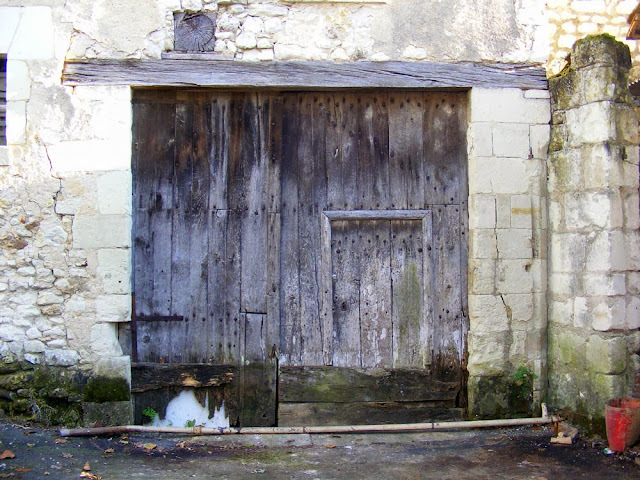 A slatted wooden door on a cellar window. Again, it should really be painted a dark colour. Used for carriages and carts to pass through in the old days they have retained all their functional and architectural advantages. Always higher than they are wide, the courtyard entry is made of two oak doors, often on a robust framework of crossbars. 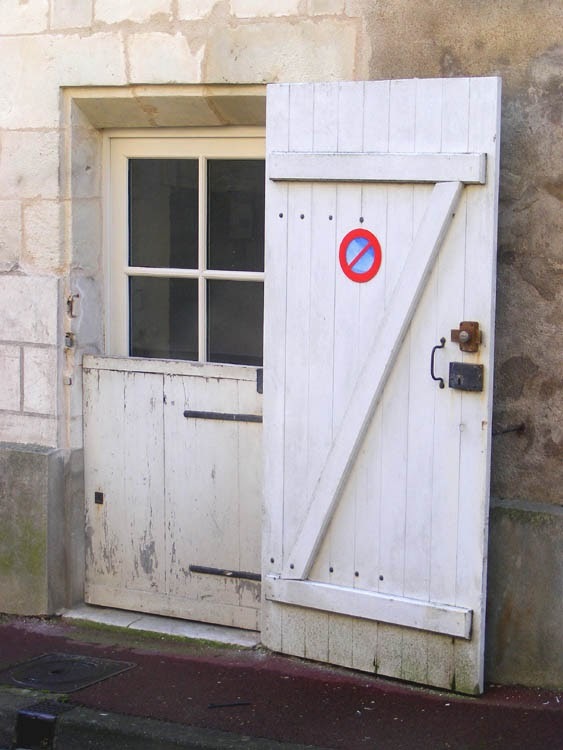 The pedestrian door (porte piétonne) facilitates regular usage. 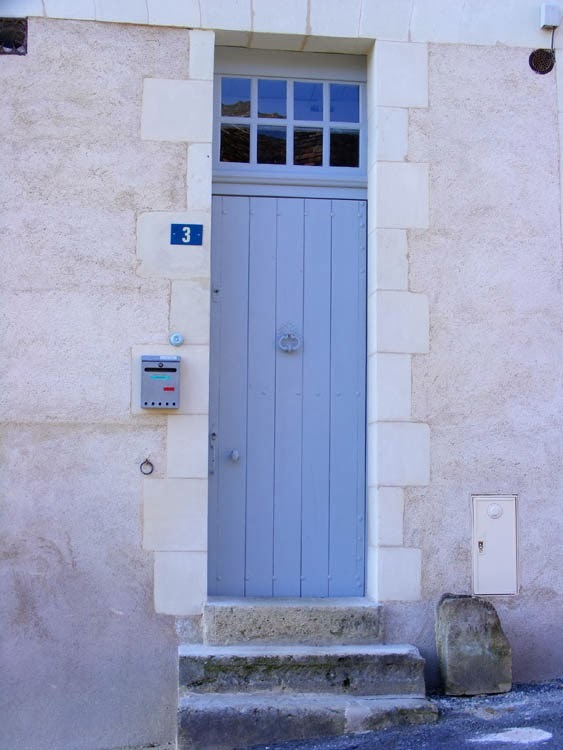 A town house door, plain, with a transom above. 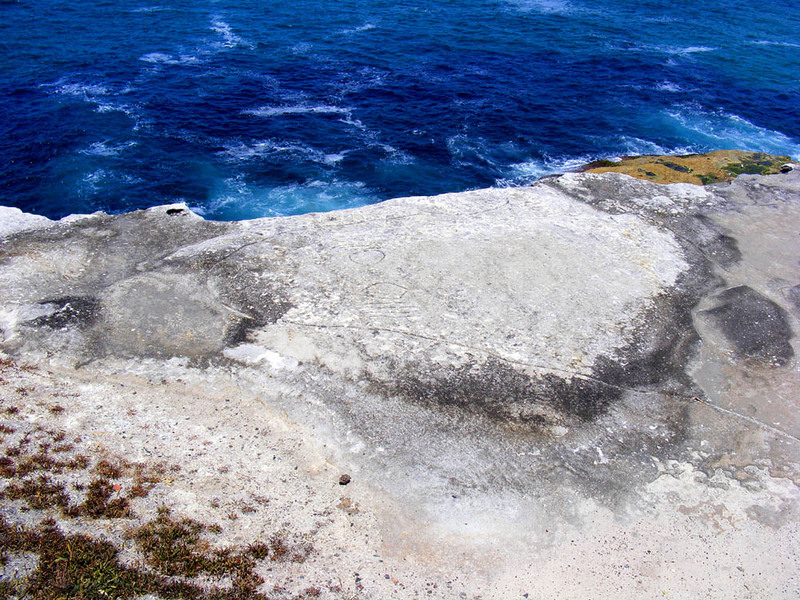 The powdery blue is typical of this area. 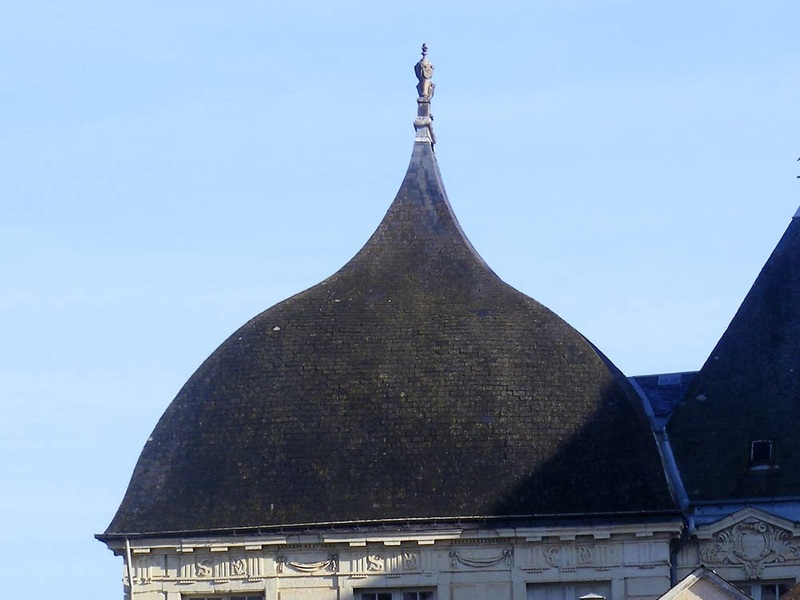 Other architectural elements punctuate certain facades in the Touraine. Basement windows or ventilators (soupiraux) are a very typical feature of town houses of the end of the 19th century and the beginning of the 20th. An ironwork grill protects them against unwanted entry attempts and came to ornament the foundation stones in the facade. This protective artefact, offering simultaneous security and elegance, is today often discarded. 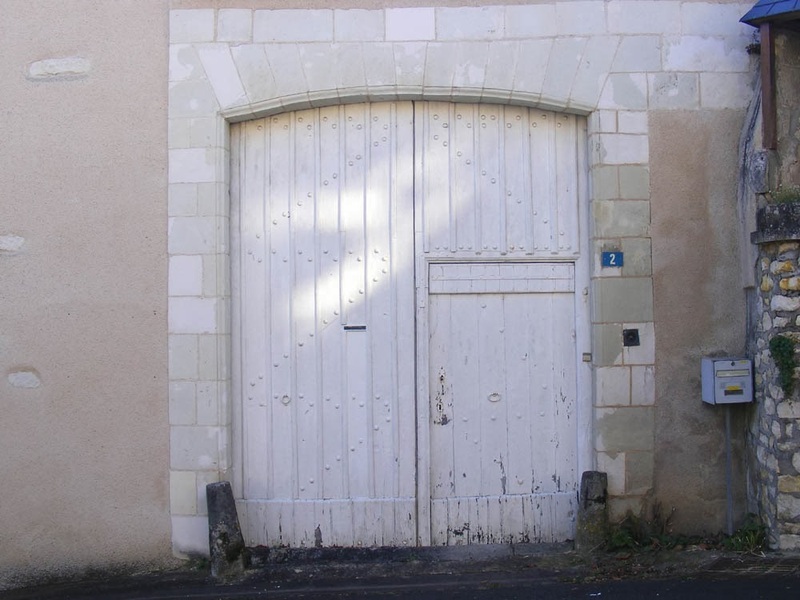 A courtyard door with an oak lintel and pedestrian door. 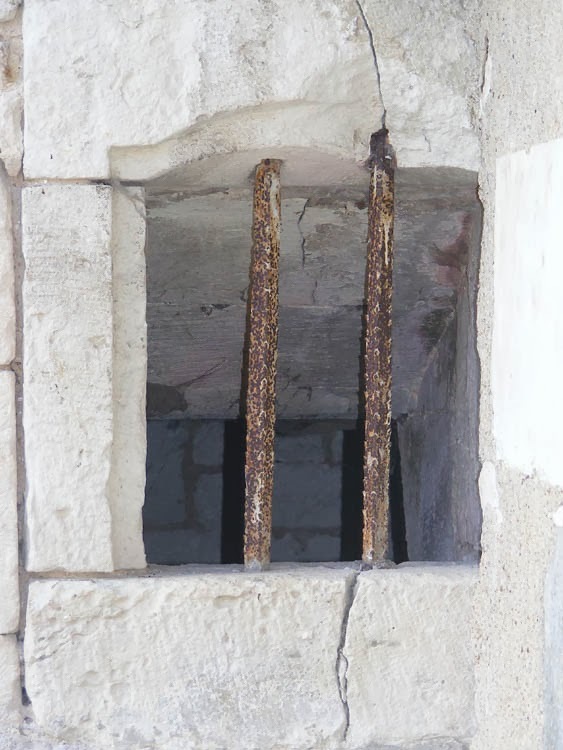 Metal was particularly used to make these protective elements. A courtyard door with cut stone surround. (white is commonly seen but pale grey would be more traditional). Vertical bars, darker than the joinery, could also be used on certain openings. 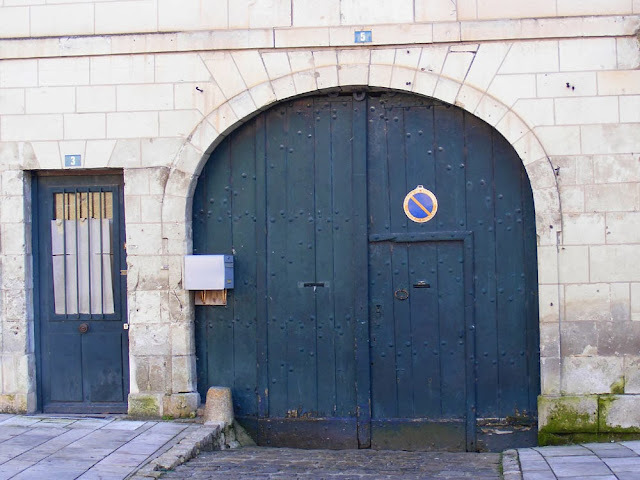 Bars protecting the glass of the door on the left, on the right a courtyard door with cut stone surround. Wooden door made of planks, in a garden wall. A farmhouse style door with separate portillon and shutter (the diagonal brace on the shutter is not traditional for here, although you see them frequently now).